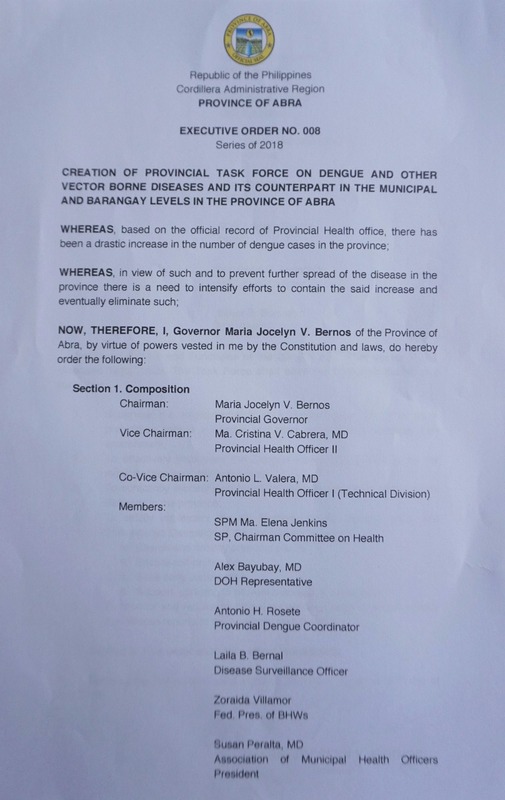 In prevention of the widespread of dengue virus in the province, Governor Maria Jocelyn Bernos signed Executive Order No.008 series of 2018 to address the increasing number of victims of the disease. Based on the official record of the Provincial Health Office, there has been a drastic increase in the number of dengue cases in the province. 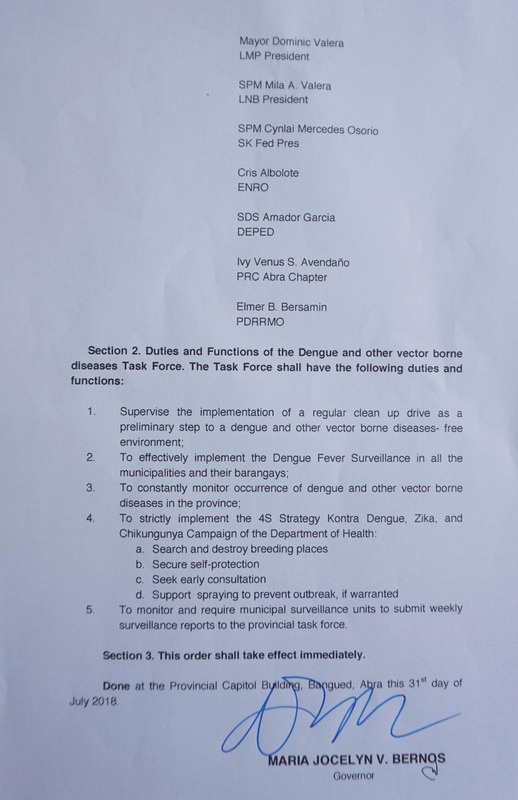 The duties and functions of the Task Force include the following: 1. supervise the implementation of a regular clean up drive as a preliminary step to a dengue and other vector borne diseases free environment, 2. effectively implement the Dengue Fever Surveillance in all municipalities and their barangays, 3. constantly monitor occurrence of dengue and other vector borne diseases, 4. strictly implement the 4S strategy kontra Dengue, Zika, and Chikungunya campaign of DOH, and 5. monitor and require municipal surveillance units to submit weekly surveillance reports to the provincial task force. The provincial government recognizes the need to intensify efforts to contain and eventually eliminate dengue and other vector borne disease cases hence the creation of a Provincial Task Force on Dengue and Other Vector Borne Diseases and its counterpart.